In the past five years, there seems to have been a boom of anthologies which have as their locus an interest in the representation of the margins of a still definitively Western- (and white-) dominated literary field. From postcolonial experiences in We See a Different Frontier (eds. Fabio Fernandes and Djibril al-Ayad; 2013) to afrofuturist and multiculturalist visions in Mothership (eds. Bill Campbell and Edward Austin Hall; 2013), to historical marginality in Long Hidden (eds. Rose Fox and Daniel José Older; 2014), anthologies have become a significant space in which efforts to expand and diversify the visible scope of science fiction can take place. In many cases, such anthologies serve as a corrective to SF/F’s blindness to what may once have passed under the proverbial radar, as in the recently released Terra Incognita (ed. Nerine Dorman; 2015), a successor to Ivor W. Hartmann’s Afro SF (2012). Anthologies are also perfect vehicles for highlighting thematic trends in sf/f short fiction. This is the case with How to Live on Other Planets, edited by Joanne Merriam and published by Upper Rubber Boot Books: featuring reprints of 25 works of fiction and 14 works of poetry from the past 15 years, How to Live on Other Planets, though flawed, successfully encapsulates sf/f’s malleability and is a welcome addition to an already diversifying field. At its most basic, How to Live on Other Planets is an anthology about the immigrant experience, but far from treating the concept exclusively in its literal interpretation, Merriam’s selections traverse the myriad ways in which meetings between alien "things," from foreigners both terrestrial an extraterrestrial to infections, ghosts, and even entire planets, affect the individuals involved. 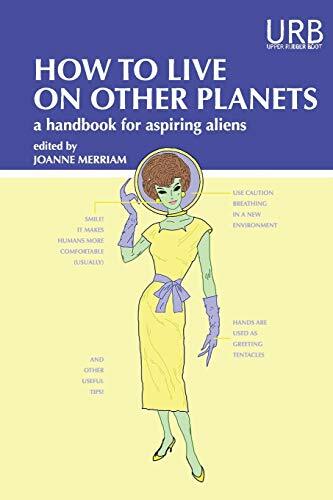 In the preface, Merriam highlights the uneasiness we tend to have with those who come from elsewhere, bridging her personal experiences as a Canadian to the anthology’s concern with the "natural comparison of alien to alien" (pg. 8). It is that sensation of uneasiness or alien-ness which guides the majority of the anthology’s works, and, thus, might be a more accurate description of the shared theme. Indeed, some of the strongest stories and poems in the collection are those which most clearly engage with the alien-ness of their subject matter through a relation to the anthology’s theme. Ken Liu’s "Ghost Days," for example, uses a 24th-century genetically modified human, Ona, and her rejection of the artifacts of a distant human past, to frame a narrative about cultural preservation and racial alienation in the 20th century. The story, as such, symbolically links Ona’s identity struggles in the midst of non-modified human teachers to the identity struggles of two generations of Chinese immigrants, providing a nuanced account of the ways in which we can become alienated by the culture around us. This theme of the complications of identity amongst immigrant populations also forms the center of Tom Greene’s "Zero Bar," which explores a near future in which genetic modifications to skin tone exist. The story follows the struggles of a Mexican-American woman as she relates her experiences with the casual racism of contemporary America, with particular focus on the exoticization of ethnic women and the stereotypes about Mexican labor by white men. The story made me immediately think of George Schuyler’s Black No More, though Greene’s narrative frames the character’s conflicted feelings about whitening her future child as a process arisen from past experiences; Schuyler’s text, meanwhile, is focused on a world where that decision has already been made. Lastly, Rose Lemberg’s somber poem of Jewish immigration, "The Three Immigrations," merges the speaker’s past, present, and future to examine the effects of forced migration. One of the poem’s repeated lines, "I made three languages to hide in" (pg. 160), attaches additional meaning to the impact of language on the immigrant experience, and this is a sub-theme which is present in many of the stories in this anthology—such as Anil Menon’s "Into the Night." A handful of the stories in the collection also deal with the alien in a more literal sense. Mary Anne Mohanraj’s "Jump Space," for example, details a scientific mission to a world whose slave class is a race of furred humanoids who have an aphrodisiatic effect on humans. This is easily my favorite story from the collection, as Mohanraj weaves together an anthropological tale with that of a family of polygamists and their complicated social structure, creating a tapestry of socio-political issues which, though not fully resolved by the conclusion, are ambiguous in all the right ways. Sarah Pinsker’s "The Low Hum of Her" also injects the alien into an existing social structure. The story beautifully explores a young woman’s relationship with a mechanical replica of her deceased grandmother in the midst of her family’s flight from their home country due to the rise of Nazi Germany and the flight of Jews to America via Ellis Island. The alienation of the protagonist, as such, comes at the hands of two traumas: one of forced alienation from one’s home and one from the death of a loved one and the distancing effect of a metaphorical reincarnation. Benjamin Rosenbaum’s "The Guy Who Worked for Money," however, shifts the process of alienation in the opposite direction, detailing life in a society in which network-based social interactions and their popularity or "good will" manifest as currency; Rosenbaum deftly explores how such a society might design its own mechanisms of alienation, and his protagonist, Nera, becomes the narrative’s necessary victim. The story’s commentary on contemporary internet culture is particularly poignant today given the increasing impact online social behavior has on how individuals are perceived, especially insofar as we use that online behavior to judge others. The anthology’s most visible flaws lie in its structure and its tendency to present stories which feel incomplete. To the first: perhaps this is a flaw in my own reading protocols, but the majority of the poetry gave the impression of serving as a palate cleanser for the politically and socially heavy themes of the preceding stories. For me, these came off less as in conversation with the larger theme or the stories surrounding them and more like signposts or "breathing spaces," with notable exceptions such as Lemberg’s "The Three Immigrations." Structurally, I would have preferred the anthology to split the fiction and poetry into their own sections, as this would have limited the often jarring shift between literary genres; doing so might also have allowed the individual poems more clearly to interact with each other in a manner similar to the fiction. Unfortunately, the existing structure made the poems easier to forget than the fiction that surrounded them. To the second: though incompleteness can serve as a literary device, it is most effective when it arrives out of a thought-provoking ambiguity or a clear shift in a character’s consciousness. Stories which neither conclude in the traditional sense nor bring their characters to a reasonable end-point—even an intentionally ambiguous one—always leave a remainder in the form of a longing for a "more" that never comes. As well-written as the stories in this anthology may be, there are a number of stories which fall into this category of remainders. Nisi Shawl’s "In Colors Everywhere," for example, is a beautifully written allegory of the imperial penal colony system in which a matriarchal society realizes that its exploitation will involve the use of women’s bodies as incubators. Though thankfully nuanced in its approach to colonial politics, the story ends just as the women of this world realize what is about to happen to them. It is a story of awakenings both literal and metaphorical, but it is also a story which demands a wider canvas, such as a novella-length treatment. Other stories, such Deborah Walker’s "Speed of Love," about two women discussing the protagonist’s apparently illegal relationship with a time-dilated man, feel much like vignettes, beginning in medias res and ending there; compared to some of the other stories in this anthology which do more to explore the worlds they present or the plots they establish, these vignettes feel out of place. Despite these flaws, I would be remiss not to declare my deep appreciation for this anthology: first, because of the way it can be positioned within the larger field of sf/f anthologies; and second, because the collected stories at worst provoke one to think about the human tendency toward alienation or the less appreciated counter-tendency to design methods for acceptance. There are numerous other stories worth mentioning here. Lisa Bolekaja’s "The Saltwater African," about two African slave sisters in Mississippi and the slave blacksmith who comes between them, is as exceptional as the tales I have already mentioned. So too are Zen Cho’s "The Four Generations of Chang E"—a strange tale of moon immigration and moon rabbits—Tom Doyle’s "The Floating Otherworld"—about an American man’s travels through what appears to be the Japanese underworld (reminiscent, I thought, of Nobuo Nakagawa’s Jigoku (1960))—Daniel José Older’s "Phantom Overload"—about ghost immigrants and the undead police who keep an eye on him—and so on. Suffice it to say, the stories and poems in this collection are, for the most part, exceptional at addressing a related theme and in exploring the social effects of immigration and alienation. Collected together, they make for a memorable themed anthology. Shaun Duke is a reviewer, podcaster, and PhD student at the University of Florida studying science fiction and postcolonialism. His work can be found on his blog, The World in the Satin Bag, or on his two podcasts: Totally Pretentous: A Podcast About Great Movies and the Hugo-nominated Skiffy and Fanty Show. He also happens to be a sentient toaster. Shaun Duke is a reviewer, podcaster, and PhD student studying science fiction, Caribbean literature, and postcolonialism at the University of Florida. His work can be found on his website, or on his three podcasts: Totally Pretentous: A Podcast About Great Movies , the Hugo-nominated Skiffy and Fanty Show , and Shaun's Rambles . He also happens to be a sentient toaster.